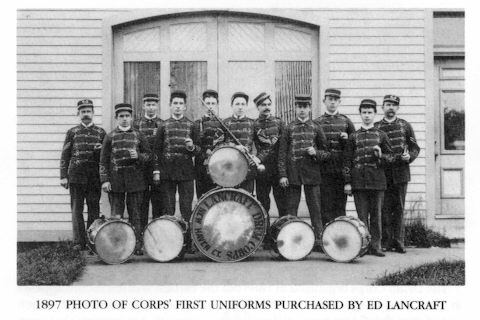 The Drum Corps was organized in 1888 but the earliest written record appears in 1892. This was an article in the New Haven Register, dated 1912, which stated that the Corps was celebrating its twentieth anniversary that year. That would put the founding of the Corps in 1892. However there is a poster at the club dated 1906 and telling of a dance to celebrate the 18th anniversary of the Corps. This would mean the Corps started in 1888. Even before the group had a name they practiced together in back of an old blacksmith shop on Fairmont Avenue just over the Ferry Street bridge. This was on the south side of the street and across from Ed Lancraft's house and oyster dock. Some time during the 1890's the railroad decided to run a line thru the blacksmith shop and it was torn down. When Ed Lancraft heard this he told the boys that they could use one of his oyster sheds for rehearsal. The boys accepted his offer and during the cold winter months Ed allowed the boys to practice in his cellar. In appreciation for all this generosity the boys decided to call themselves The Lancraft Fife and Drum Corps after Ed Lancraft the "oyster man"
The question of uniforms came up and again Ed Lancraft came to the rescue. He bought and paid for twelve uniforms similar to circus bandsmen, consisting of dark blue trousers with dark blue coat trimmed in black. The coat buttoned up to the neck, a visored hat topped it off. A few years later Mr Lancraft bought another set of uniforms much like the first but the trousers were lighter blue and the coats were gray with the same black trim. This was during the 1890's. On March 10, 1898 at a regular meeting of the corp it was decided that the present membership be declared charter members. The original book containing these minutes is in the possession of the Corps historian. The Corps had many homes over the years in the Fair Haven section of New Haven and our history records many privatations and extreme conditions, but the Corps survived and grew. 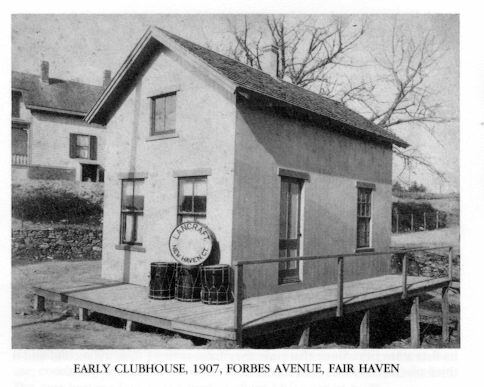 The Lancraft "old timers" have always been an important part of the Corps but never more than when the Corps decided to build the first club house. A building fund was started and the old timers answered the call handsomely. Mike English, father of the great Dan English, donated the land in back of his home and took a mortgage and the two story club was built and dedicated to Dan English. The mortgage was paid off in 1955. During this time new uniforms and drums were needed and the Corps stepped up to the challenge by taking on a heavy schedule of parades,one of which took the life of our beloved Walter Scott. 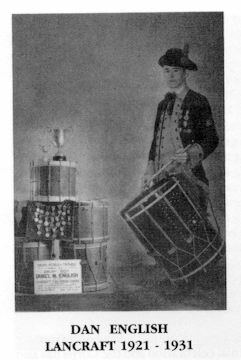 Five new snare drums were bought from Gus Moeller at $85.00 each,and these are still in use today. But alas a new highway (Interstate 95) was to take the club and land, and Lancraft was on the move again. This time a bit of luck brought us to our current location in North Haven. A member of Stony Creek told a woman of our plight and she offered to sell the Corps several acres behind her home. 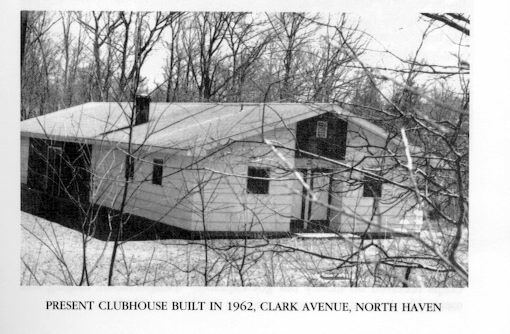 On Saturday morning August 31, 1962, the members began to build their own club house and by Labor Day 1962 the building was up, enclosed, shingled, and painted. Lancraft moved in March of 1963 and held the first "old timers night in our new home on June 13, 1963; normally the last Thursday in April. 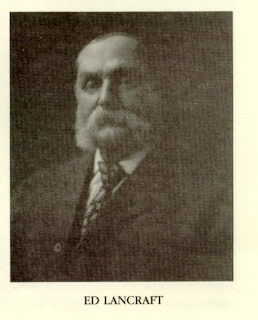 The first drums used by the Corps were small ones made by Mr Loomis. Then in 1900 they obtained four big barrel drums which resembled the oyster kegs used by Mr Lancraft in his oyster business. For this reason the Lancraft Corps was often referred to as the Oyster Keg Corps. At a regular meeting in 1898 it was voted to hold rehearsals on Thursday evenings and to this day Lancraft still rehearses on Thursday nights. In that same year the first new member to be taken in after declaring charter members was Frank Howard, and the first member to be put on the honorary list was charter member Oscar Denenery who, in 1899 asked to be so placed. A memorable event occurred in 1899 when the Connecticut Fifers and Drummers Association invited the Corps to compete in their annual state convention to be held in Ansonia on August 4th 1899. The Corps accepted the invitation but did not win. 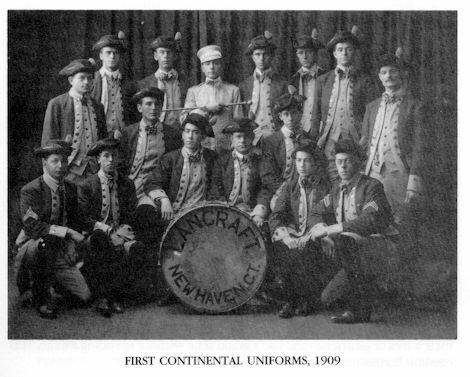 The following year at South Norwalk Lancraft finished third behind American Gramaphone ant the winners were the Edgewood Drum Corps of New Haven. It wasn't until 1909 that Lancraft won its first state title. Since that time they have won 31 firsts, 19 seconds and 8 third place prizes. Many of the traditions of those early days are still evident today.On January 10, 1899 the Corps gave a ball which they were to play several selections. One of those pieces was "Rally" which is still a favorite number with the present Corps. One year later, December 27, 1900, the Corps voted to do no more "Thank you" jobs as the requests for these jobs piled up. This policy is still in practice today. The problem of rasing money in those days was just as acute as it is today. In 1899 the Corps conducted a trolley car ride, and the minutes of the following week report it was a huge success and showed a profit of .50 cents. In 1900 the Corps held a ball which was also a success and showed a profit of $20.00. The price of admission was .25 cents and if you wanted supper it was an extra 10 cents. The Corps could be hired for $2.00 a man and quite often for $1.00 per man when the full Corps of 12 turned out it cost the sponsor the grand sum of $12.00. While the Corps was never rich in money it was rich in fun, experiences, friendship and good musicians. Mr. Lancraft often took the gang for moonlight rides in the harbor in one of his oyster boats. The men brought their wives or girlfriends and had a grand time with out spending a dime. This pastime continued into the 1930's. In the early days travel was by trolley car for local activities and by rail for longer trips. Many times members spent more time enroute than at their destination. Old records show that they would leave the club after work on Wednesday on the milk train and not get back until Tuesday the following week; we wonder what kind of jobs they held. Eventually cars and buses took over and then the ultimate means of travel - the jet airplane. In 1970 Lancraft was invited to participate as special guests at the Swiss National Competition. This event was arranged by Alfonse Grieder, a Swiss drum champion who had met the Corps when he was in this country studying for a higher degree. For all his hard work in arranging this trip Alfonse was made an Honorary Member of Lancraft, an honor extended to very few. The trip to Switzerland started an exchange between Swiss and American Corps which has resulted in several trips by Swiss corps to the states and return trips by American Corps to Switzerland. At present there are a number of Swiss groups that play and are uniformed in the American Ancient tradition. and a American type muster was held in Lugano Switzerland each year. One of the outstanding events in the history of the corps occurred in May 1958 when Lancraft was selected to attend a celebration in Colonial, Williamsburg Virginia. This affair was called "The Prelude to Independence" and lasted one week. The Corps was invited back in 1959 to be the official host Corps. Lancraft has had great times but has also known sorrow at the loss of some great champions at early ages. The Corps has continued in the tradition that has instilled a sense of pride in all that have worn the Lancraft uniform. This pride extends to their families and friends both in and out of the Ancient Drum corps movement.